distribution Known in NC only from the extreme southeastern corner of the state -- Robeson and Columbus counties (i.e., the Lumber River). This is a poorly known Southeastern species ranging southwest to MS and n.w. FL, but with large gaps in the range. The only SC records are an old one from Greenville County (upper Piedmont) and a 2016 one (photos and specimen) from Calhoun County (in the upper Coastal Plain). abundance Formerly, not rare along a short section of the Lumber River just north of the SC state line; however, there have been no reports in the state in nearly 50 years. There have been a few recent surveys of this section of the river, but no individuals have been found. Thus, presumably very rare, if it still occurs, in the state. Dunkle (2000) calls it "scarce" throughout its range. flight "Early June to late Sept." (Dunkle 2000). The 11 state records with dates fall between late August and early October. However, the recent SC record is from 4 August, and thus perhaps surveys in NC should be earlier than late August. habitat Forested creeks and rivers with sandy bottoms and clean water. behavior Males apparently forage mainly in low light conditions in early morning, cloudy weather, or near dusk. Males seldom make patrols over water, but forage from twigs along the water's edge. comments This species is so poorly known that it has not even been recorded from one state -- GA -- that lies near the center of the range. 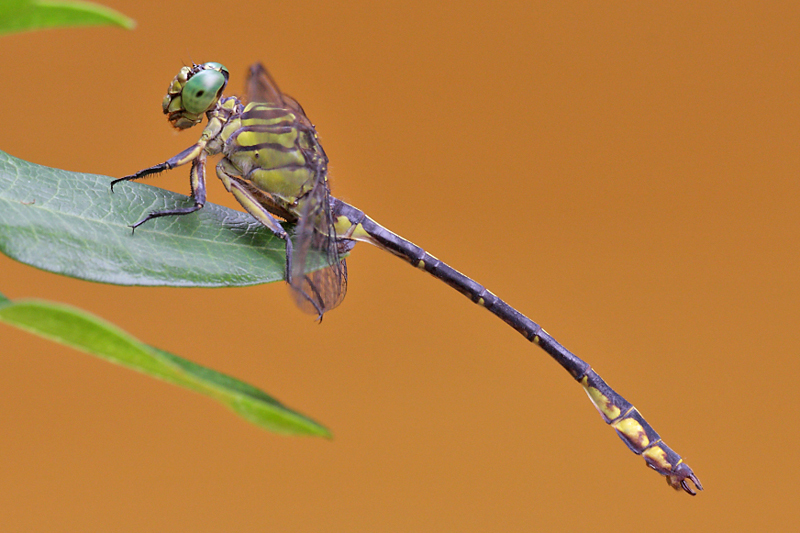 Even though Belle's Sanddragon may have the most restricted range in the NC Coastal Plain of any dragonfly, the Townes's Clubtail may well be the poorest known in that province, as only Dunkle (2000) and Paulson (2011) contain information about the species. There was a flurry of collections of this species in the Fair Bluff area of Columbus County along the Lumber River in the 1960s; whether it still occurs in NC at present is not known. In 2012, the NC Natural Heritage Program moved its NC Rank from S1 (very rare) to SH (Historical); this does not mean that it is thought to be extirpated, but that there is no information to indicate that it currently still exists in the state. However, as the Lumber River is still heavily forested in many areas and is a State Natural and Scenic River, there is a good chance that Townes's Clubtail still occurs there, if not elsewhere in the state. Ed Corey conducted a brief survey of this part of the Lumber River in fall 2013 and did not find the species. Also, Mark Shields has searched this section of the river many times in late summer and fall 2015-2018 with no luck. With Chris Hill's recent SC record being in early August, it seems that more surveys of the Lumber River (if not other rivers close to SC) should take place starting in early August.